More than 500 people have signed petition being circulated on paper and online by Park Slope Neighbors to ask Whole Foods to tweak its plans for the huge store it is planning at Third Street and Third Avenue in Gowanus. We wrote about the petition campaign when it was launched early this month, but the details are worth repeating. 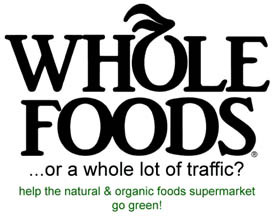 The petition asks Whole Foods to adopt a transportation-management plan that would cut traffic and to include a green roof or solar panels on the the building instead of a rooftop parking deck. It also asks for a reduction of parking by at least 100 spaces. The group is asking for a jitney service to shuttle shoppers to the subway, for "ample" bike parking and for pedicabs. It also "cites the energy and environmental benefits of green and solar roofs - especially important for the ecologically fragile Gowanus Basin," in the words of a new Park Slope Neighbors press release. Says the group's Eric McCLure: "We think a Whole Foods Market would be a great addition to the neighborhood, but it's disappointing that they appear intent on implementing a suburban-style plan. Since only about 40% of households in this area own cars, we'd like to work with Whole Foods to de-emphasize vehicle traffic in favor of other modes of transportation to and from the store. We also think Brooklyn deserves environmentally friendly measures like green or solar roofs, which Whole Foods has implemented or planned for in other markets." Actual petitioning signing on paper has been slowed by the frigid weather of the last few weeks, so there should be a lot more signed petitions headed over to Whole Foods once volunteers start collecting signatures in the neighborhood. The Green Roof Whole Foods Market blog is working with Park Slope Neighbors to push for the green roof and transportation improvements via the petition. Park Slope Neighbors helped convince Commerce Bank to tone down their branch on Fifth Avenue in Park Slope and to eliminate a drive-through window. Less parking at whole foods = more people driving around the neighborhood looking for a parking spot. Seems like a dumb thing to ask for, if you're interested in reducing traffic in the neighborhood. Haven't they already broken ground? It seems a little late to be pushing for a change. Why didn't these people ask Whole Foods years ago when they announced the site? i really hope the signers aren't drivers. really. Whole Foods will be a destination store for the entire borough of Brooklyn, similar to Fairway in Red Hook. Fairway has increased its parking due to increased demand. Would you want cars double-parked on surrounding blocks because they can't park on the WF lot? Jitney service? Dirty, smelly buses like paratransit or the other PS favorite and time saver, Fresh Direct. Guess the minimum wage workers have to grovel for the rich. Speaking of mimimum wage workers, wonder what the supermarket workers union says about WF's anti-union position? WF is for the whole borough, many of whose residents own cars to get to work or to be with family. The only thing that sounds interesting is the green roof, and space for bicycle parking. Another knee-jerk PS item that's fodder for GAWKER. No they haven't broken ground here for construction purposes! The ponds on the site are a result of the brownfield cleanup work only! Whole Foods doesn't yet have an approved Brownfield Cleanup Plan from the State of New York. And just as important, they do not have an approved building permit from the City of New York. Yes we, the effected community, still have an obligation to ask why are they planning to build this silly piece of architecture-- which is a cellar with parking on top. And since these plans only exist on paper, it is a perfect time to ask that it not be built in this manner. is a stretch to consider driving to a whole foods as pretty ridiculous? organic food, horrible exhaust. and there is a bus that runs along 3rd ave, as well as subway service a bit farther away. Our community has long been served by local commercial strips nestled within our residential blocks. When even the elderly can walk to collect their daily marketing needs busses don't even need to be part of the program. Only big-box stores need mass parking. Only the suburbs need big box stores. Whole Foods distribution methods are the WHOLE problem here. LESS PARKING AT WHOLE FOODS? WHO IS THE RETARDED HALF-WIT BEHIND THIS LATEST PARK-SLOPE STUPIDITY? WHAT A FIRST CLASS IDIOT. MORE PARKING, YOU FOOL! MORE PARKING! Ya! Lets have so much parking that there will be no place left for the store--more and more--so that all Park Slopers will have a place to leave their cars besides on the street. NO WHOLE FOODS AT ALL.